Some reflections following a permaculture workshop on Empowerment and Resilience that I run alongside Finn Mackesy from Auckland Permaculture Workshop (APW). Resilience has become the new buzzword. Where a few years ago everyone was talking about sustainability, now they are all talking about resilience. The problem is that many of them don’t seem to know the difference. I was recently at the Environmental Defence Society annual conference where the theme was resilience. It was a great conference with many excellent speakers, but at least one corporate functionary was talking about how his company is increasing its resilience by implementing more efficient production methods. Actually, resilience is more likely to be a function of increased redundancy in the system than increased efficiency. The best systems find the right balance between efficiency and strategic redundancy. Even more concerning is that people use the word ‘resilience’ when they actually mean ‘robustness’. There is a great TED talk by a guy in the US who goes around looking at why houses fail in storms. It’s very interesting, and shows startling evidence that most roof, and therefore house, failures come from very small details – two instead of three nails in the hurricane strapping, or using the standard one and a half inch instead of two inch nails to hold the trusses on. He talks about building resilience by making the house stronger, but what he is actually doing is building a more robust house. This may seem like pedantry of the highest order, but if people are trying to develop strategies to build resilience, in own lives or in their communities and businesses, then they need to understand what that means. Very often, strategies to build more robustness will run counter to strategies to build resilience. It is important to find the right balance so that systems are robust but also have the capacity for resilience. This can only be achieved if you are clear about what you are trying to achieve. Robustness comes from the Latin word for ‘oak tree’, and that is a very good illustration of its meaning. A robust system is strong, able to withstand stress and pressure, able to shake off the storms that might break a lesser tree. Resilience comes form the Latin word for ‘spring back’. Grass is the classic example – the wind can never break grass because it just gives way and then returns when the pressure is gone. Resilience is the ability of a system to bend, or regenerate itself when things break. Ecosystems often go through phases of great robustness, such as a climax forest characterised by high levels of specialisation, complex interconnections, lots of embodied energy, followed by release, such as from a forest fire. The breaking up of that embodied energy and recycling it back into the system allows a range of species to make us of it, to build and reorganise, and sets the scene for a new phase of growth, with increasing levels of complexity and specialisation until the climax stage is reached again. 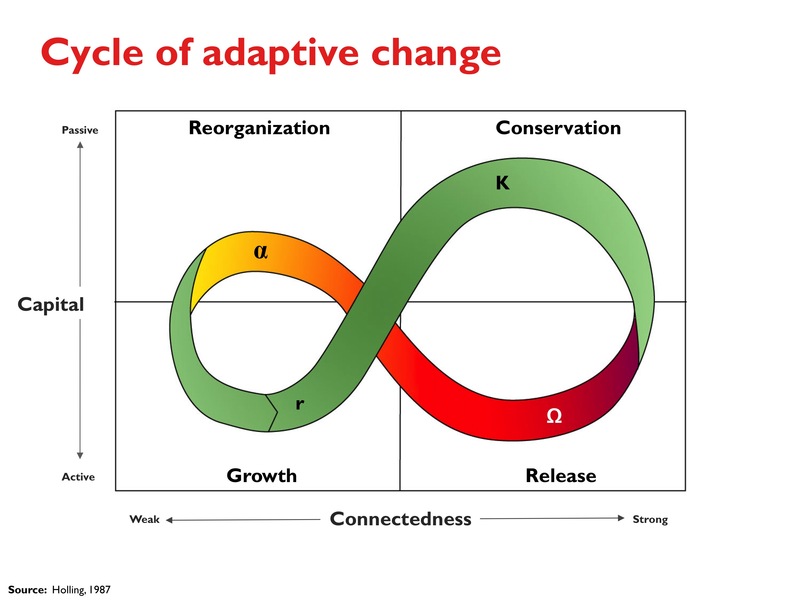 This is called the cycle of adaptive change and is an ever changing and dynamic balance. Strategies of sustainability often seem to be locked into trying to maintain the climax stage. Hence, a focus on increased efficiency and more specialisation. The sole focus is building more robustness into the system. There is nothing wrong with robustness, but if it is the sole focus it leaves no room for resilience when the system sooner or later inevitably fails. The global economy that is built on fossil carbon is like that. Design systems like permaculture are more about how to find the right balance between robustness and a capacity for resilience.